A best selling item! Unisex wig. PERFECT FOR YOUR PRODUCTION OF CATS .. I HAVE SOLD THOUSANDS OF THESE TO THEATRE COMPANIES ALL OVER THE WORLD! All of my wigs are brand new with tags. This is from the Lacey Costume Wigs New York Collection. All my wigs will fit the average head, but will also adjust to fit a larger head as well. They fit men and women, but are not designed to fit children. 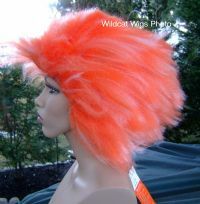 This is a THEATRE COSTUME WIG made of synthetic wig fiber, and comes with care instructions. This would be perfect for the musical theatre CATS. This feels like fur. 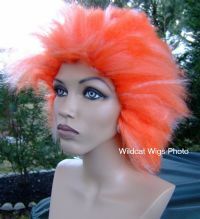 (Trivia .. the actual wigs used on Broadway for Cat's were made of Yak Hair!) This is TOTALLY FABULOUS! This auction is for the Orange and White as pictured. NOTE: I WILL TRY TO KEEP THIS ITEM IN STOCK AT ALL TIME, BUT IF I AM SOLD OUT, THIS WIG WILL NEED TO BE ORDERED FROM MY SUPPLIER, SO PLEASE ALLOW UP TO 2 WEEKS FOR DELIVERY.